The mythology of Japan has a long history dating back more than 2,000 years. It became part of two major religious traditions: Shinto, an indigenous religion, and Buddhism, which developed in India and came to Japan from China and Korea. Japanese mythology includes a vast number of gods, goddesses, and spirits. Most of the stories concern the creation of the world, the foundation of the islands of Japan, and the activities of deities, humans, animals, spirits, and magical creatures. Some myths describe characters and events associated with particular places in Japan. Others are set in legendary locations, such as the heavens or the underworld. For many centuries myths were transmitted orally in Japan. In A . D . 712, a written version of the mythology, the Kojiki (Records of Ancient Matters), was compiled for the Japanese imperial court. The tales in the Kojiki tell of the creation of the world, the origin of the gods, and the ancestry of the Japanese emperors, who claimed descent from the sun goddess Amaterasu. Hachiman, one of the most popular gods of Japanese mythology, was the patron of warriors. Chinese and Korean history and mythology. Both the Kojiki and the Nihongi contain elements of Taoism, a Chinese religious movement that was introduced to Japan by the 600s. In Japanese mythology, everything in nature has a kami— a deity or spirit. As a result, the Japanese pantheon is enormous, with some sources claiming that there are millions of different spirits and deities. Throughout Japan, local myths and legends tell about the kamt of a particular place, such as a rock, a pair of trees, or a mountain. However, several major deities appear in significant roles in a number of stories from different regions. The two most important creator deities are Izanagi and his sister Izanami. According to the myths, they made the islands of Japan as well as many of the gods and goddesses. Izanagi and Izanami also appear in a story about a descent to Yomi-tsu Kuni, a land of darkness and death associated with the underworld. Perhaps the best-known Japanese deity is the sun goddess Amaterasu. Said to be the ancestor of the imperial family, she brings light into the world and is responsible for fertility. Her shrine at Ise is the most important shrine in Japan. Amaterasu has two brothers: the moon god Tsuki-yomi and Susano-ô, a powerful and violent god often associated with storms. Of the two, Susano-ô plays a more important role in mythology, appearing in a number of major legends, including several with Amaterasu. Ôkuninushi, a descendant of Susano-ô (possibly his son), is a central character in the Izumo Cycle, a series of myths set in the Izumo region of western Japan. Like the heroes in the legends of other cultures, Ôkuninushi has many adventures and undergoes various ordeals. One of the most popular deities of Japanese mythology is Hachiman, a patron of warriors. The character of Hachiman is based on the emperor Ôjin, who lived in the A . D . 300S and was renowned for his military skills. According to tradition, after Ôjin died he became the god Hachiman. In the 700s, Hachiman became part of the Shinto pantheon. The god Inari appears in few myths, but he is important because of his association with the growing of rice, the major food crop in Japan. Thought to bring prosperity, Inari is the patron of merchants and sword makers. Among the many spirits and creatures in Japanese mythology are the tengu, minor deities that are part human and part bird. According to tradition, they live in trees in mountainous areas. The tengu enjoy playing tricks on humans but resent being tricked themselves. They are more mischievous than wicked. The Oni, a more threatening group of spirits, may have originated in China and traveled to Japan with Buddhism. These horned demons, often of enormous size, can take human or animal shape. Sometimes invisible, the Oni have the ability to steal the souls of humans. They can be very cruel and are associated with various evil forces such as famine and disease. Japanese mythology also includes other Buddhist deities. 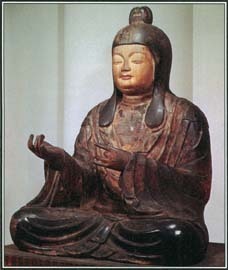 In addition to stories about the life of Buddha, many tales concern Amida, the ruler of a paradise called the Pure Land. Kannon, the protector of children and women in childbirth, and Jizô, who rescues souls from hell, are also important Buddhist figures. The most important stories in Japanese mythology deal with creation and the goddess Amaterasu. Deeply rooted in nature, they vividly describe the formation of the landscape and the origin of forces such as fire, wind, and light. Creation Myth. According to the Kojiki, in the beginning there was only a primeval ooze, out of which heaven and earth were formed. Life emerged from this mud. In heaven three deities—followed by two others—appeared. These five became the Separate Heavenly Deities. They were followed by the Seven Generations of the Age of the Gods, two single deities and five male and female couples. The two single deities came out of a reedlike substance floating in the ooze. A group of monkeylike creatures called kappa displays both good and evil qualities in Japanese myth. Associated with water, they live in rivers, ponds, and lakes and carry water in a hollow space on top of their heads. If the water spills, the kappa lose their magical powers. Kappa drink the blood of humans, horses, and cattle. But they also eat cucumbers, and families can avoid being attacked by throwing a cucumber bearing their names into the kappa's watery home. Among the kappa's good qualities is a tendency to be polite. When they meet someone, they bow, often spilling the water in their heads. They also always keep their promises. In many tales, humans outwit the kappa by forcing them to make promises. One story from Japanese mythology features a young hero named Yoshitsune and the king of the tengu, a group of half-human and half-bird deities. In this illustration, Yoshitsune grabs the king's nose. jeweled spear. When they pulled up the spear to see if any material had gathered on it, drops of salty water dripped down into the sea and formed an island called Onogoro. Izanagi and Izanami left heaven and went to live on the island. They married and produced eight children, who became the islands of Japan. Izanagi and Izanami then created gods and goddesses of the trees, mountains, valleys, streams, winds, and other natural features of Japan. While giving birth to the fire god Kagutsuchi, Izanami was badly burned. As she lay dying, she produced more gods and goddesses. Other deities emerged from the tears of her grief-stricken husband. When Izanami died, she went to Yomi-tsu Kuni, the land of darkness and death. Izanagi followed her there and tried to bring her back. But Izanami's body had already begun to decay, and she hid in the shadows and told Izanagi that she could not leave. Izanagi could not resist looking at his beloved wife one last time. When he lit a torch and saw her rotting corpse, he fled in terror. Angry that Izanagi had seen her, Izanami sent hideous spirits to chase him. Izanagi managed to escape, and he sealed off the passage to Yomi-tsu Kuni with a huge boulder. Izanami remained there and ruled over the dead. Feeling unclean from his contact with the dead, Izanagi decided to bathe in a stream to purify himself. As he undressed, gods and goddesses emerged from his discarded clothing. Others came forth while he washed. Susano-ô came from his nose, Tsuki-yomi emerged from his right eye, and Amaterasu appeared from his left eye. Izanagi divided the world among these three gods. He gave Susano-ô control of the oceans, assigned Tsuki-yomi the realm of the night, and made Amaterasu the ruler of the sun and the heavens. Myths of Amaterasu. One famous myth tells how Susano-ô, Amaterasu's brother, was unhappy with his share of the world and caused much destruction. Banished to Yomi-tsu Kuni, he asked to go to heaven to see his sister the sun goddess one last time. Amaterasu became concerned that Susano-ô might be planning to take over her lands. The two agreed to a contest to prove their power. If Susano-ô won, he could stay in heaven forever, but if he lost, he would have to leave. Amaterasu asked for her brother's sword, which she broke into three pieces and chewed in her mouth. When Amaterasu spit out the pieces, they turned into three goddesses. Susano-ô then took a string of five star-shaped beads that Amaterasu had given him. He put the beads in his mouth, chewed them, and spat out five gods. Susano-ô claimed victory because he had produced five gods and Amaterasu had produced only three goddesses. However, Amaterasu pointed out that he had created these gods from her possessions, which proved that her power was actually greater than his. Susano-ô refused to acknowledge defeat, and Amaterasu allowed him to remain in heaven. While in heaven, Susano-ô began doing things that offended his sister and violated important taboos. He destroyed rice fields, made loud noises, and dirtied the floors of her palace. Finally, Susano-ô killed one of the horses of heaven, skinned it, and hurled it into the hall where Amaterasu was weaving cloth. This so angered Amaterasu that she hid in a cave and refused to come out. When the sun goddess concealed herself, the world was plunged into darkness, plants stopped growing, and all activities came to a halt. Desperate for Amaterasu's return, 800 gods gathered to discuss ways of getting her to leave the cave. A wise god named Omori-kane proposed a solution. The gods hung a mirror on the branches of a tree outside the cave. Then they had a young goddess named Ama-no-uzume dance to music while they laughed loudly. Amaterasu heard the noise and wondered what was happening. Opening the door to the cave a little, she asked why the gods were so happy. They told her that they were celebrating because they had found a goddess superior to her. Curious at who this goddess might be, Amaterasu opened the door wider to look and saw her own image in the mirror. When she paused to gaze at her reflection, a god hiding nearby pulled her completely out of the cave. Another god then blocked the entrance with a magic rope. After Amaterasu emerged from the cave, her light shone once again, and life returned to normal. To punish Susano-ô for his actions, the gods banished him from heaven. The Izumo Cycle. The Izumo Cycle of myths features the god Ôkuninushi, a descendant of Susano-ô. One of the most famous stories is about Ôkuninushi and the White Rabbit. After hearing this story, Ôkuninushi told the rabbit to bathe in clear water and then roll in some grass pollen on the ground. The rabbit followed this plan, and new white fur soon grew on its body. The rabbit, who was actually a god, rewarded Ôkuninushi by promising that he would marry the beautiful princess. Ôkuninushi's success angered his brothers, and a number of other myths in the Izumo Cycle tell about the struggles between them. Mythology plays an important role in the lives of the Japanese people today. Myths and legends are the basis of much Japanese art, drama, and literature, and people still learn and tell stories about the gods and goddesses. Traditional kagura dances are performed to honor the deities at Shinto shrines. Legend traces the origin of this ancient art form to the dance that drew the goddess Amaterasu from her cave. 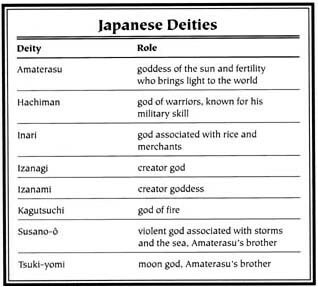 See also Amaterasu ; Buddhism and Mythology ; Devils and Demons ; Giants ; Inari ; Izanagi and Izanami ; Kojiki ; Nihongi ; Susano-Ô ; Tricksters ; Underworld . "While giving birth to the fire god Kagutsuchi, Izanami was badly burned. As she lay dying, she produced more gods and goddesses. Other deities emerged from the tears of her grief-stricken husband." Somewhere along that line...hmm, I've read in other articles that Izanagi slayed his new born son Kagutsuchi with Amenonuboko (the jeweled spear) out of anger because he made her died. and dozens of deities born from Kagutsuchi's remains, something like that. Is there a legend of the Eight Samurai? I found the Movies of "The Seven Samurai" and "The Legend Of The Eight Samurai" . I know "The Seven Samurai" has no historical fact but what about the Eight? Is it a Japanese legend, History or just a movie?